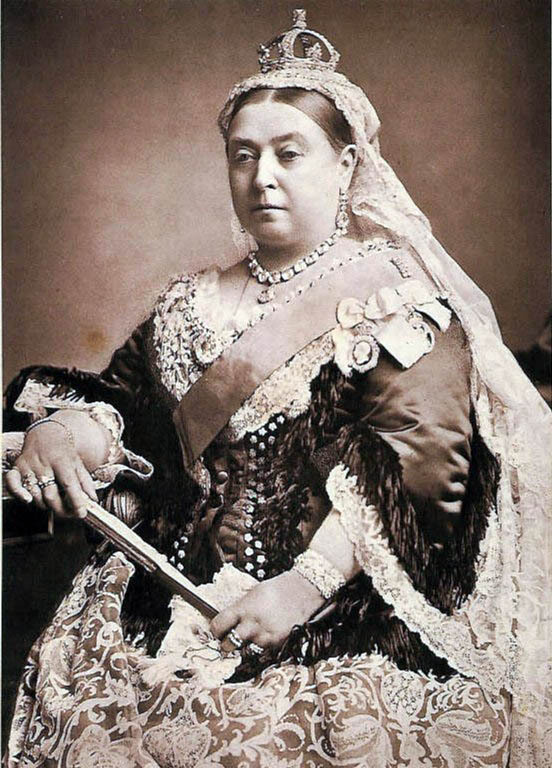 Queen Victoria’s Golden Jubilee was celebrated on 20 and 21 June 1887. On 20 June the day began quietly with breakfast under the trees at Frogmore, the resting place of her beloved late husband, Prince Albert. She then travelled by train from Windsor to Paddington and across the parks to Buckingham Palace for a royal banquet in the evening. Fifty foreign kings and princes, along with the governing heads of Britain’s overseas colonies and dominions, attended the feast. She wrote in her diary of the event: “Had a large family dinner. All the Royalties assembled in the Bow Room, and we dined in the Supper-room, which looked splendid with the buffet covered with the gold plate. The table was a large horseshoe one, with many lights on it. 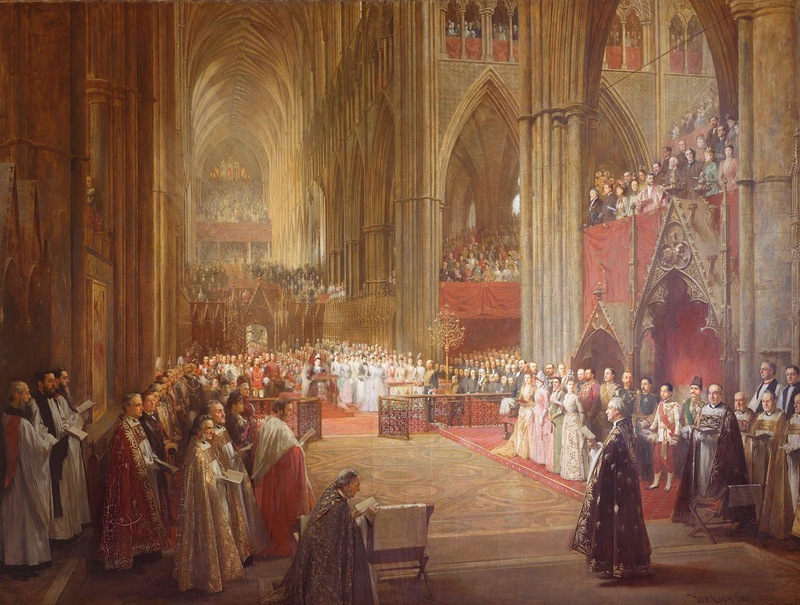 On the following day, Queen Victoria travelled in an open landau to Westminster Abbey, escorted by Indian cavalry. The procession through London, according to Mark Twain, “stretched to the limit of sight in both directions”. Bodies of soldiers in one colour, then another, marched past the spectators, who were accommodated on terraced benches along 10 miles of scaffolding erected for the purpose. Queen Victoria rode in the procession in her gilded State landau, drawn by six cream-coloured horses. She refused to wear a crown, wearing instead a bonnet and a long dress. The Queen took a keen interest in her Empire, and many representatives of the colonies attended the celebrations. The number of Indian princes – “men of stately build and princely carriage”, noted Mark Twain – in splendid ceremonial dress, who attended to pay their respects, and the Indian cavalry which escorted the Queen to Westminster Abbey, attracted much attention. On return to the Palace, she appeared on the balcony, where she was cheered by huge crowds. In the Ballroom she distributed Jubilee brooches to her family. In the evening, she put on a splendid gown embroidered with silver roses, thistles and shamrocks for a banquet. Afterwards she received a long procession of diplomats and Indian princes. She was then wheeled in her chair to sit and watch the fireworks in the garden.